I apologize for the recent post hiatus. Life's been busy! But I do have stories to tell! I have made it out to several new-to-me restaurants the last couple of weeks. 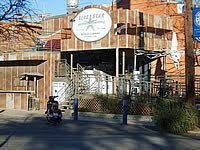 First was Blue Star Brewery. This place has been on my list of places to go for a while. My Basic Prep class met for dinner as an end of semester celebration. After only seeing my classmates in our required uniform, it was interesting to see everyone in street clothes. While there, I got a tasting flight of all their beers made in house. The Pale Bock and English IPA were okay, but I'm not really a fan of the hoppiness of pale ales. The one I didn't like at all was the King William Barley Wine that was reminiscent of my stinky running shoes. But then, another friend loved it, so to each their own. The had a cask-conditioned stout that was okay, but again not my cup of tea. There were three I really liked: a stout that smelled like chocolate and was very drinkable; a pale bock that was like a light Mexican beer; and an excellent amber that was my favorite of the lot. The brewery also had pretty good munchies, a step up from normal bar food. Cappycino's and Cappy's are locally owned restaurants in Alamo Heights right around the corner from Central Market. I have a friend that works there, so I got great treatment while I was there. Cappycino's is more of a burgers-pizza-coffee shop kind of place. I got a seat at the bar that overlooked the kichen so I could chat with my friend. I got the Mediterranean Grilled Cheese Sandwich - fontina cheese, tomatoes, basil, and olive oil. Absolutely fantastic. And the honey vinaigrette on my side salad was quite excellent too. Top it off with a lovely decaf latte and biscotti, and I'm hooked. Absolutely going back there again. 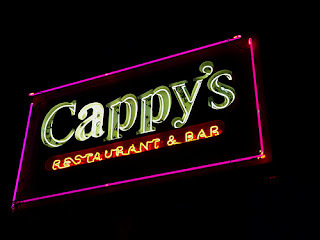 I got personal delivery of Cappy's. Mind you, this is not a standard service, I've just got the hook up. I got a crusted halibut on some vegetable fettucine with a butter sauce. It was incredible. I also had some bites of the Catch of the Day, but I didn't remember what the fish was. It was a grilled steak like tuna, but sweeter and not as heavy. the chef's special vegetables that day were a mixed vegetable medley that included yellow beets. I also had some wilted spinach. It's so easy to have bad wilted spinach, but this was some of the best I've had. I am really impressed with the menu and creativity in the dishes I've tried. I can't speak for the dining experience there, but after a quick walk in, I am intrigued and want to eat there for real. 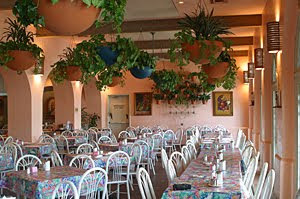 For Mother's Day, Mom requested to go to Los Barrios, recommended to her by some of her coworkers. It was also the subject of an episode of Bobby Flay's Throwdown about puffy tacos. I didn't actually have the puffy tacos, since they're not my favorite Mexican fare. I had Pollo a la Salsa with a poblano sauce, which was really pretty good, but fairly heavy. Mom had enchiladas. The salsa had the heavy flavor of tomato sauce and had a good kick to it. Pretty good, but not my favorite. On the table they also had a kind of chimichurri that was really mild but had great flavor, mostly of cilantro lime and garlic. I loved finding these new San Antonio only places after going to a lot of chains in the past couple of years. Again, April was way hectic. I get some reading done, so here are the mini-reviews for those books. 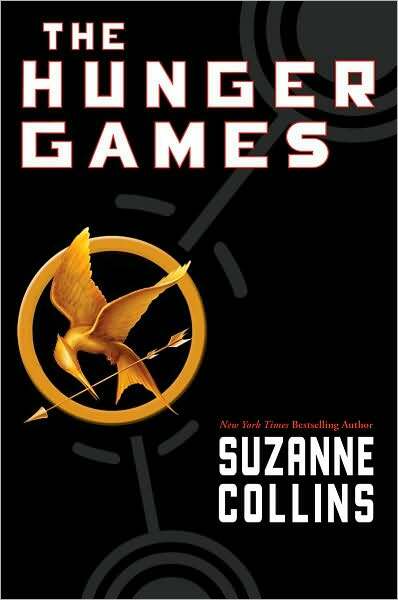 Hunger Games by Suzanne Collins. This was recommended by Amanda and Brittany. I devoured this one almost nonstop, or as nonstop as I can get with my current schedule. It reminded me a lot of Lord of the Flies since it involved kids in the wilderness having to deal with very adult issues. But any other similarities or differences may be lost on me since I hated the book in high school and didn't even finish it. It also reminded me a lot of the huge amount of reality competition shows that currently make up the TV schedules. It had a beautiful ending, one that could forever let the reader wonder what happens next or be a launching into a sequel. 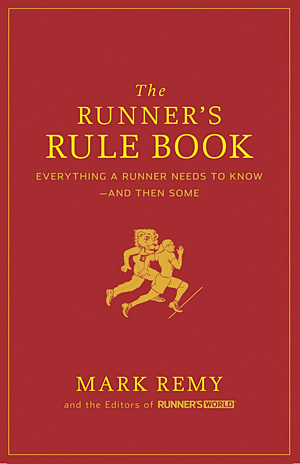 The Runner's Rule Book by Mark Remy. This was an awesome read. It timed it really well, as this is what I used to kill the hour and a half I was at the Austin Cap10K starting line waiting to go. Remy is one of the daily bloggers on RunnersWorld.com and one that I try to read every day. His humor is perfectly suited to these short quips. It was a really quick read and it made me want to go out and run, but to make sure I took the time to enjoy it when I did. 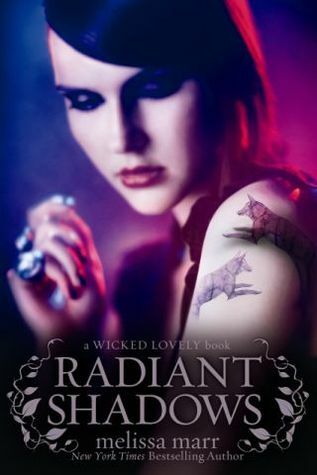 Radiant Shadows by Melissa Marr. This is the fourth book of the Wicked Lovely series. This book features Ani, a half-faery, half-human of the Dark Court and Devlin of the High Court. It featured characters previously introduced in Ink Exchange and Fragile Eternity. It was really interesting to go back and reread Ink Exchange and see the seeds Marr planted in the earlier books that came to fruition in the later books. It speaks of master of the plan for the Wicked Lovely world, almost like Harry Potter, but a much smaller scale. The only thing that bothered me was the more omniscient point of view. I was used to Marr's style switching between a couple characters alternating at chapter delineations. But this was further away from the characters and switched mid chapter. It was harder to follow. I'm starting to get over this series. If it had an indefinite end, I'd probably quit reading at this point. As there is just one more planned, Darkest Mercy, I will probably finish out the series. Making the Cut by Jillian Michaels. So I was contemplating changing up my workout routine. I get the spam email from JillianMichaels.com, one of which advertising this book. This is the first book of hers that I picked up. I haven't followed Biggest Loser in order to know her methodology. I was disappointed that this book didn't include more of the explanation behind the plan. It didn't allow for the reader to apply the lessons for themselves, particularly in the diet plans. This book is meant for people who want to get "ripped" in thirty days. Its style was close to a "shut up and do what I say because I know what I'm talking about." The particular exercises she uses are very specific to her, ones I've never heard of before. I'm sure that this book will give results to those that stick to the plan. But this isn't the plan for me. I am not going to follow blindly. Unbound. This was an anthology of short stories: Ley Line Drifter by Kim Harrison. Harrison is author of the Hollows series which I loved and plowed through all of the books available last fall. This short story stars one of the major characters, a pixy named Jenks as he takes an investigation on without his employer, Rachel Morgan. He is his usual comedic self, complete with his hilarious swearing that I catch myself saying in my head. It was a great short read and complements the rest of the Hollows world well. 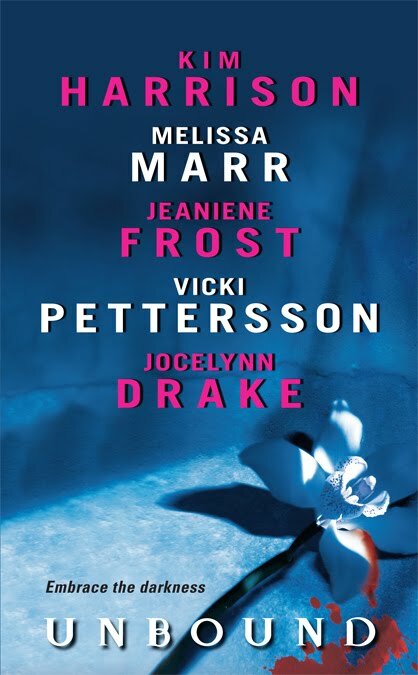 Reckoning by Jeaniene Frost. I wasn't familiar with this author. It's about a vampire, Bones, who hunts down two ghouls who are committing gruesome murders in NOLA during Mardi Gras. Eh, wasn't very impressed. Dark Matters by Vicki Pettersson. Also an author I've never heard of before. I absolutely loved the idea behind this world. Superheroes and supervillians exist in isolation and work to keep humans unaware of their existence. Comic books actually are the documentation of politics and current events in their world. The characters in this were great, and I definitely want to read more from here. The Dead, the Damned, and the Forgotten by Jocelyn Drake. This story made me suddenly VERY over vampire stories. I really didn't get into it very much and found it too like all the other vampire worlds out there. Two Lives by Melissa Marr. Marr is another of the headliners on this anthology that made me buy the book. This story is about a young glaestig (a particular species of fairies) named Eavan who is trying to prevent a drug dealer from enslaving young women. This story had no ties whatsoever to the Wicked Lovely stories. It was a good story, but again I'm getting a little tired of Marr. Overall, it was a good quick read and I'm glad it introduced me to Jocelyn Drake, but otherwise not fantastic. I am still working my way through Wicked, but I am finding I enjoy reading on my nook or iPhone. It's really portable and convenient. The books that I have in hard copy are gathering dust on my shelves, but the eBooks I go through really quickly.